Recently, my office decided to go deeper in search of groundwater. 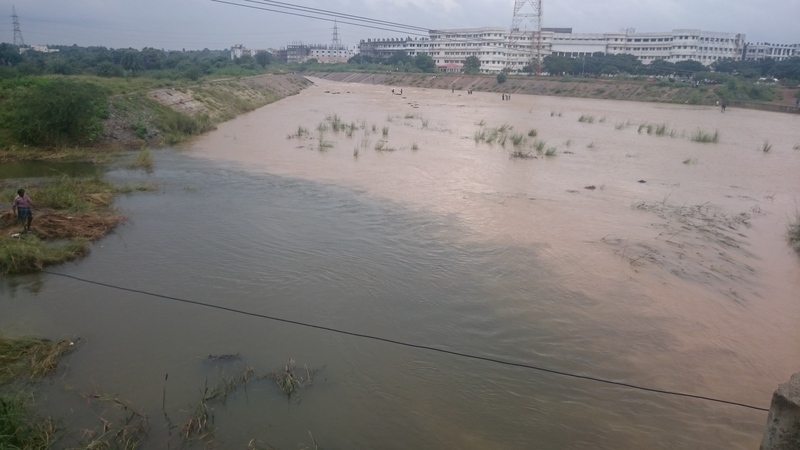 This is in Coimbatore and the existing borewell had been yielding water at 200 feet. Now the water table has fallen and they had to go down to 436 feet. Excessive drawdown, lack of rains, and overall poor water management has contributed to this. Another sad story of a child who fell into a borewell and died. Oh dear how many such gory deaths? Okay most of the cases of children falling into borewells seem to occur in rural India. This says something about the borewell diameters. 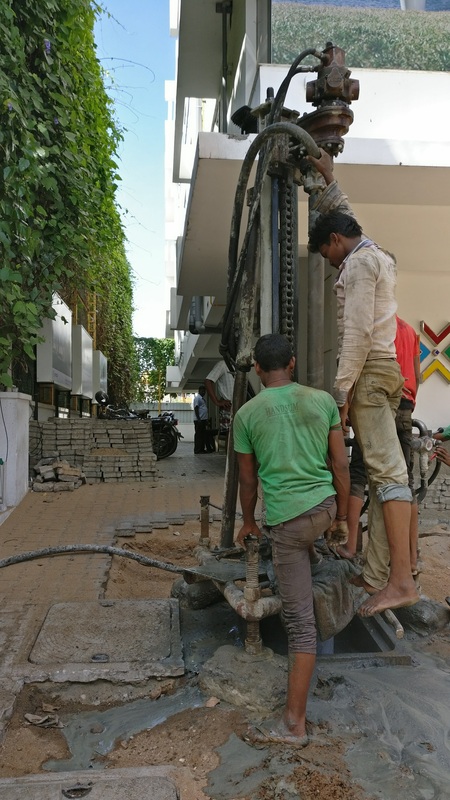 In the cities, borewells are dug for domestic purposes. These are lesser in diameter. So looks like the bigger borewells are the problem. 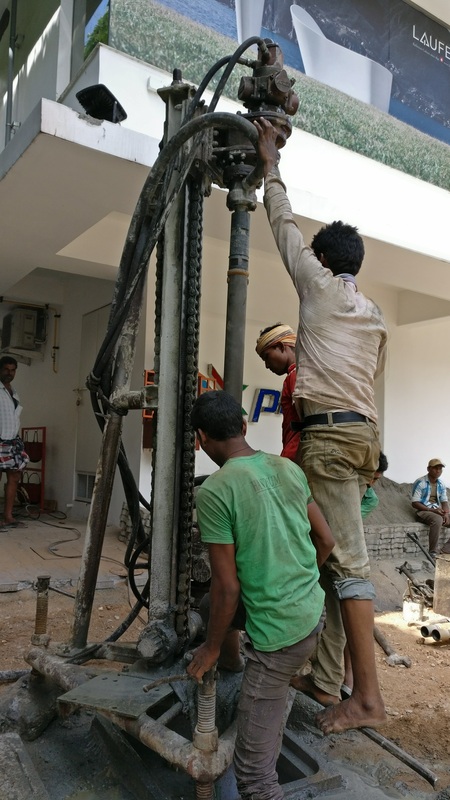 Some manufacturing companies too dig large-diameter borewells. These might be typically located in the villages or suburbs. However, this is not the primary reason – in the villages, people constantly seek groundwater. The moment a farm or company needs water, they try to dig a well. However, open wells are not always the solution (open wells are dug when you have groundwater available easily at shallow depths. Open wells are convenient. 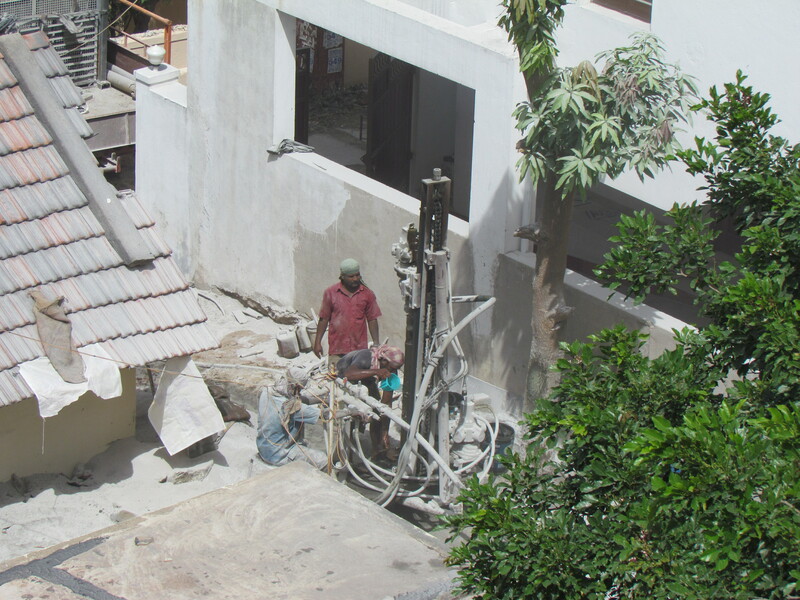 But then groundwater is not easily available – thus borewells are dug to a greater depth. Also companies need more water and wells won’t suffice). People need water and where does that come from? River or lake water supplies is not always available to all areas. Thus, groundwater is the source. And people dig to great depths to get groundwater. Groundwater for various reasons – summer, over exploitation, less recharge etc at times goes down deeper (water table). However, many of the borewells do not yield water and are “abandoned”. The driller might have used casing and partially sealed the hole. Mostly, though the moment there is no water, the drillers pack up and leave. 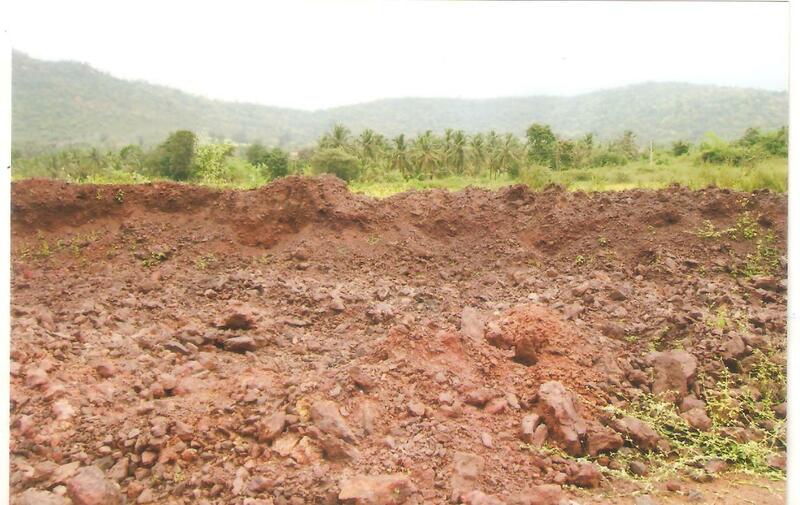 Vegetation takes over and these borewells are forgotten. Some day a child wanders over and falls. in. The diameter is enough for the child to fall in. 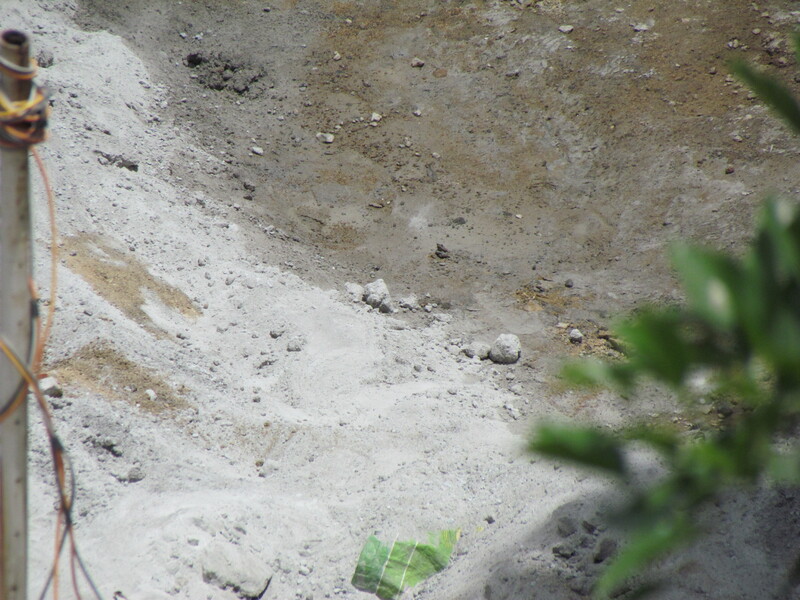 However, it takes time to realize that the lost child could have fallen into the borewell. 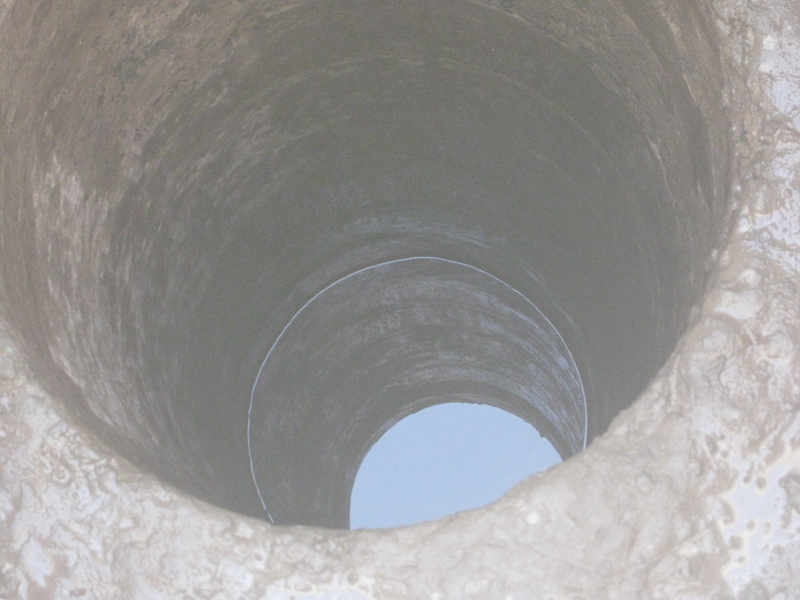 The inside of the now defunct or not used borewell might have collapsed. Some bores are 300 feet deep (or more). The child might not always fall to the bottom but get stuck in the mud in between. This is not easy to find out as the hole is dark and deep. It is not a case of just pulling out the child through a vertical shaft. So rescue operations begin and if the child is closer to the surface, a rescuer gets in and pulls them out. However, if the child has fallen to greater depths, a camera is sent into the hole and then a parallel bore is dug. From there another horizontal bore is dug. Quiet often the rescue succeeds but not always. A lot of Geology is involved and rescue plans must be fast and precise. But even with the best geophysical instruments, it is not easy to estimate the type and size of rock that blocks access to the point where the child is stuck. 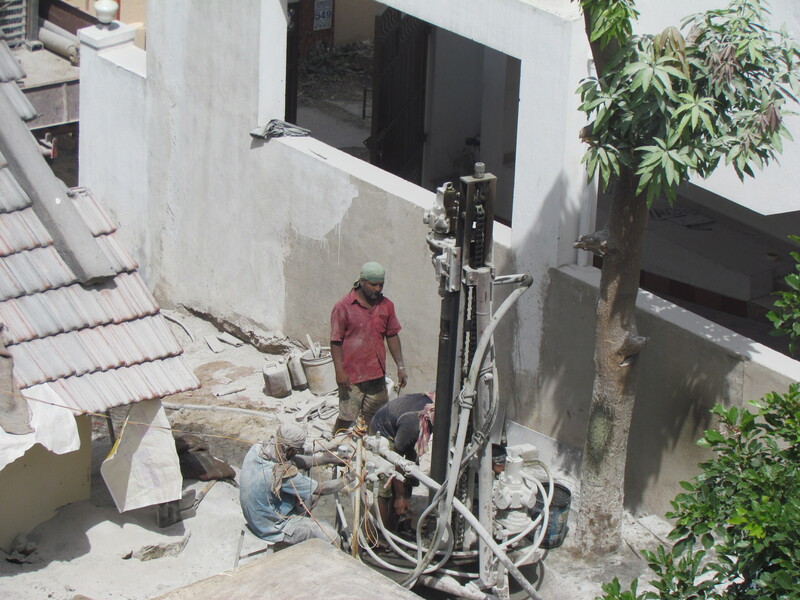 Moreover, drilling through rock can make the entire borewell collapse. The simplest solution should be to seal all the holes the moment they are not used. Sadly, this negligence and ineptitude devours a child. The northeast monsoon brings rainfall to Chennai in October-November. 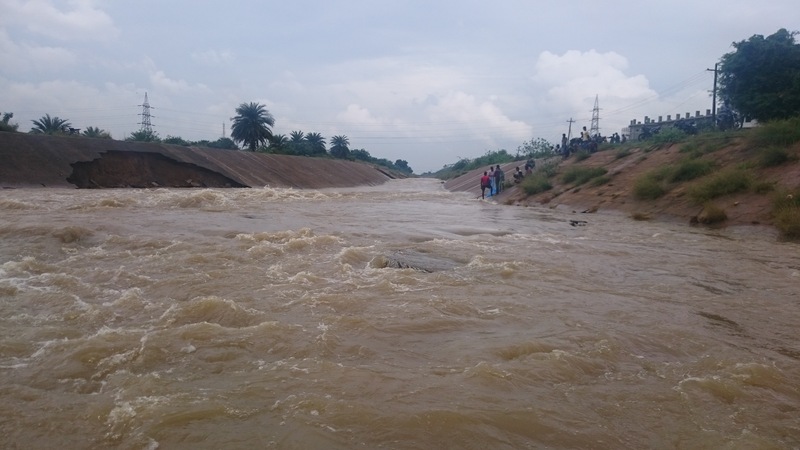 However, 2015 witnessed excess rainfall and the city was “surprised”. Rains have not been good enough in Tamil Nadu in the past. However, now and then it rains in excess and many parts of the state suffers due to unplanned development. Buildings have come up in dry lake beds (also when streams were dry). Obviously, this leads to inundation. The runoff was not much – just about 2-3 feet but because the entire culvert is paved, water gains speed. Notice the small local streams serving the main stream. The culvert is reddish with sediments. 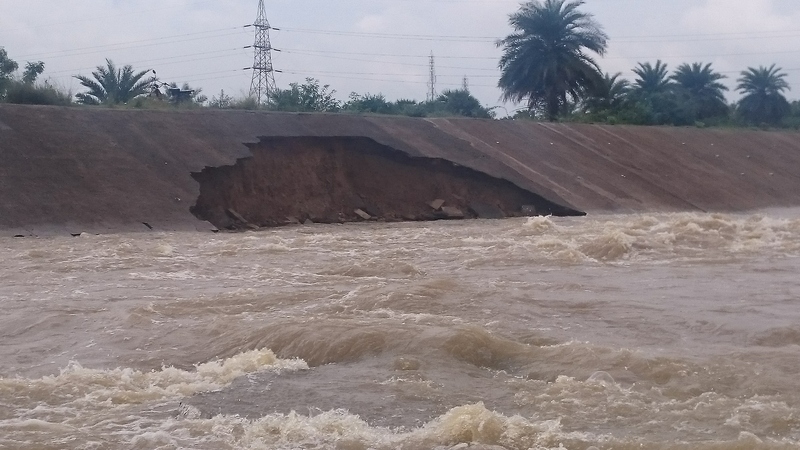 Notice the left bank – that has given away to the force of water and rain. Wallpapers of oil rigs or volcanoes or rock formations. 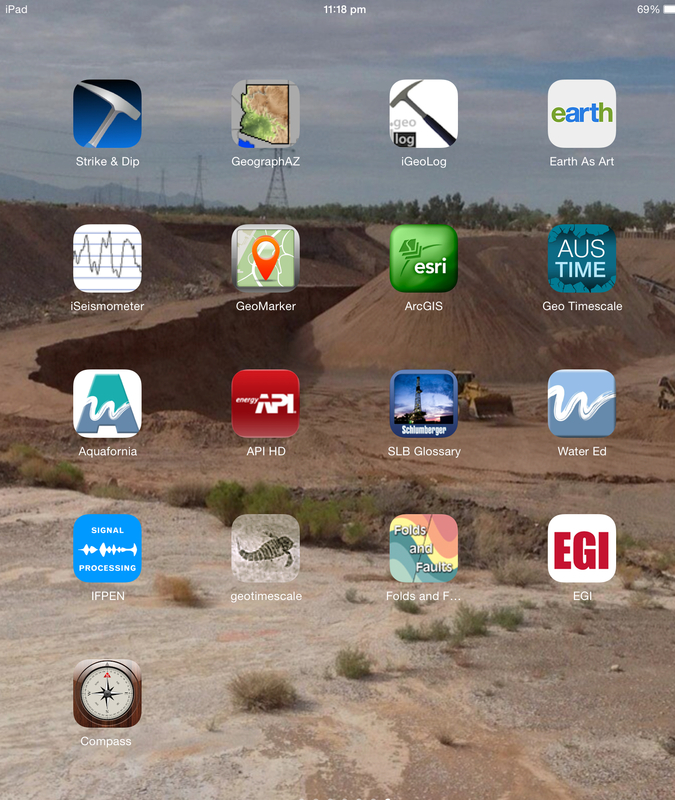 This is probably how a geology lovers iPad screen might look like. 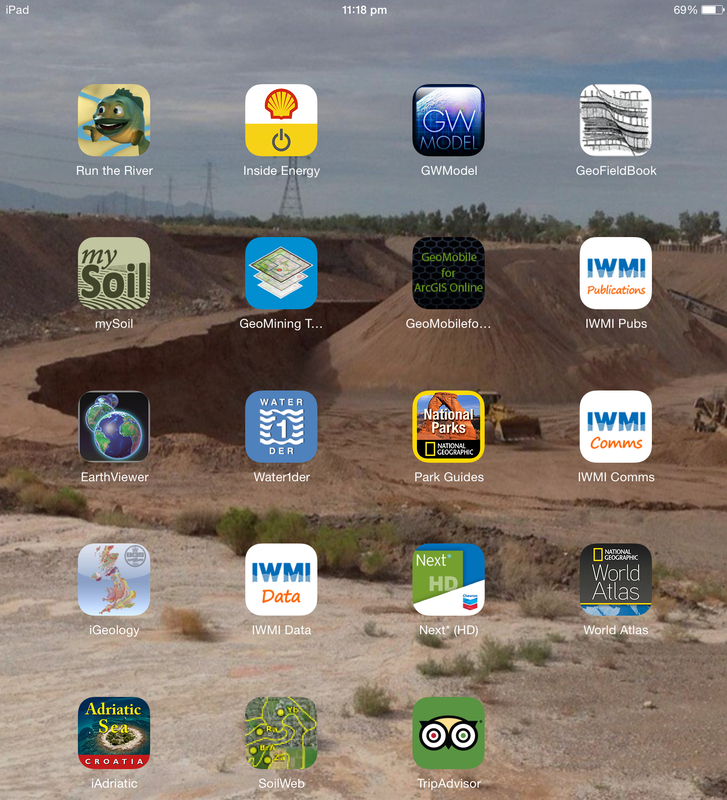 Add these days geology-related apps make up the tablet screen morphology. There are quiet a few Android and iPad apps for Geology and what better way to start blogging about them than with Screen shots of them all? The screens here are from my iPad. Ironically, I used a Samsung Note (a tablet) to scribble down this blog! Yes, I used the stylus to write this post. Technology is really useful! I will review a few of the geology apps in later posts. Late last year, I had the good fortune to meet a trained pilot who volunteered to take me and my flatmate up in his plane over Auckland. I’ve always wanted to do this–and in fact had investigated flight prices ($199 for 15 minutes?! Ouch! )–so leapt at the opportunity. We were up there for a few hours on a beautiful early summer day, flying from south Auckland around to Rangitoto and Whangaparaoa, then to Devonport and over the Harbour Bridge and behind the Sky Tower. It was exhilarating. Flying is one of my absolute favourite things to do–if I had the time and money, I’d definitely take pilot lessons. Not exactly a “geoscience” post but something related and important. Yes, this is about Geology books. Let me clarify what I mean when I say “books on Geology”. I primarily refer to the text books used at University level and beyond. There are many “general” books on Geology with glossy finish and colorful pictures. These are for kids and people who have no knowledge of Geology. For example, books on Dinosaurs appeal to many. Fiction based on Geology – novels to be precise – is rare and the ones that come to mind are Michael Crichton’s Lost World and the lesser known Sarah Andrews’ novels where the setting often “includes geology”. So back to our topic: Geology text books in Chennai libraries. For some reason, the text books we want on Geology never seem to be available. In this day of Internet, Kindle, Mobile devices, and digital books, physical books still have a charm. Many text books are available online and you can download them instantly. However, like print books, digital books are just another medium and cannot be a substitute for quality content. Although, new text books are available on the different geoscience subjects, not every new book can replace the existing books that were the pioneers. Most universities still recommend the “old” text books as they are good for learning the concepts. Indeed, very similar content is available in newer books on the same subject, but the older books don’t often have a good substitute. While some new books are better than the old books for many reasons, the older books are still the best. Colleges must have a basic mandatory syllabus or curriculum and recommend courses for that. This means teaching the basics – and these are still available in the books printed 40 or 60 or even 80 years ago. However, these “classic” (or old) texts are not easily available. Even on Amazon, probably the best website for buying books, many old books are not available. If you purchase these old books (second-hand) from other sellers, often importing is not easy. Also many of these books are expensive. The only way to access them is through libraries. Department Collections – these are only accessible to staff of the department. These have the best collection of books ever. But is internal. The geology departments of Madras University, IIT, Presidency College, and Anna University are examples. Madras University Library (Chepauk) – Most Geology books (and other books) are badly maintained and now are available for reference. Madras University AC Tech Campus Library – available to students and staff. Collection is OK but some books are not available. Anna University Library – available to students and staff. Collection is very good and has books on mining, water, and geoengineering but some books are not available. Similarly, other geoscience departments provide access to books for students and staff. Geological Survey of India (GSI), Chennai Reference – This is quiet an advanced collection of maps, papers, and journals. Text books are less but this is not a typical library. Is more for researchers and people who work in the geology domain. Secretariat Library, Fort St. George – Had a small collection of books on Geology. For staff. Connemara Public Library – used to have a fine collection, but most books are gone. Either lost or have been worn beyond repair. Poorly maintained. Still okay with a reference and lending collection. The Directorate of Public Libraries. A no-cost library and has a few books on Geology. The American Library of the US Consulate General. Very few books on geology. The British Council Library: professional, neat, and modern. Many books on Geology, Hydrogeology, Sedimentology, and Petrology. You can become a member, borrow and read. Online access to journals is useful. Probably the best in India in terms of management and services – the drawbacks being that only text books by British authors are stocked and the cost of membership could be high for students. A separate section for paleontology! I found some new books such as Groundwater Geoscience by Fitts, Introduction to Hydrogelogy by Nonner – very colorful and illustrated to make reading a pleasure. There are books on Groundwater Modeling as well (by Nevin K)! Even the ESRI GIS book on Arc GIS for Groundwater! Apart from this – Shelly’s Petroleum geology and Seibold’s Sea Floor are available. Disappointed at not finding Submarine Geology by Shepard or Mining Geology by Arogyaswamy or Bowen’s Igneous Petrology. These are the classic old books. Pictures are of the Anna Centenary Library at Kotturpuram. In Chennai, during summer, groundwater levels dip. Water supplies through tankers or pipe lines also dwindle in many areas. So people naturally look at borewells to provide water at least for essential purposes such as washing. Drinking water anyhow is purchased. Cramped spaces between houses. This essentially is a city planner problem and India cannot afford to provide spacious housing to all its citizens. Only the very wealthy can have some elbow room. The poorer you are, the less space you occupy. Therefore, those who do own a house with enough space to get a borewell, are in some sense lucky. However, many house owners have only a parking lot or a small entrance that is quiet often shared with other houses. Often they do not have pipe lines that supply water. So they have no other go but to go underground in search of water. Total lack of scientific approach. While the house owners desperately need water, the water well drilling services agencies seem to take up any job they can. Of course they need the money. Yet, in many cases, I have never seen a hydrogeologist or some qualified person make an initial assessment. If there is space – such as in large apartment complexes or shopping malls, then yes a geologist uses geophysical resistivity methods and provides an assessment. It doesn’t make sense to do a study when you just have room enough for a car or motor cycle to be parked. So if you can spare only 15 feet, then what options do you have? Are basic factors looked into? Yes hardly enough ground space exists but at least are the basic factors addressed? 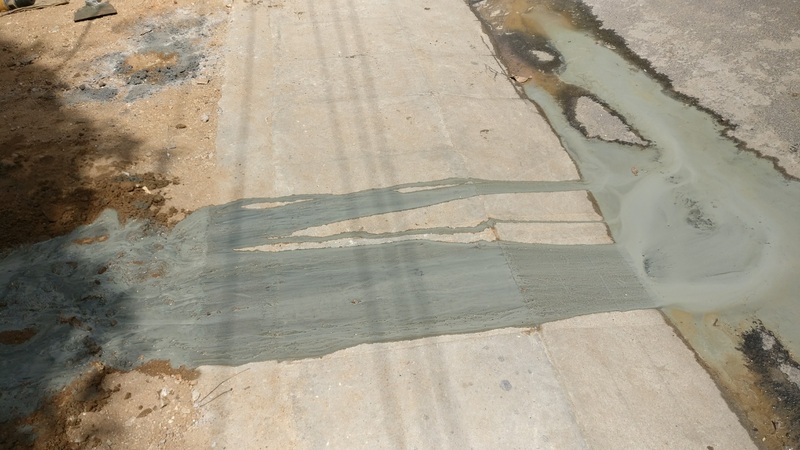 I hear people say that the groundwater smells of sewage. Now how is that possible? Are there adjacent drains that leak? Or are ponds of sewage mixing with groundwater? Or are the pungent smells due to another factor? Is the salt content due to fluorides or nitrates? Are there any other harmful elements? 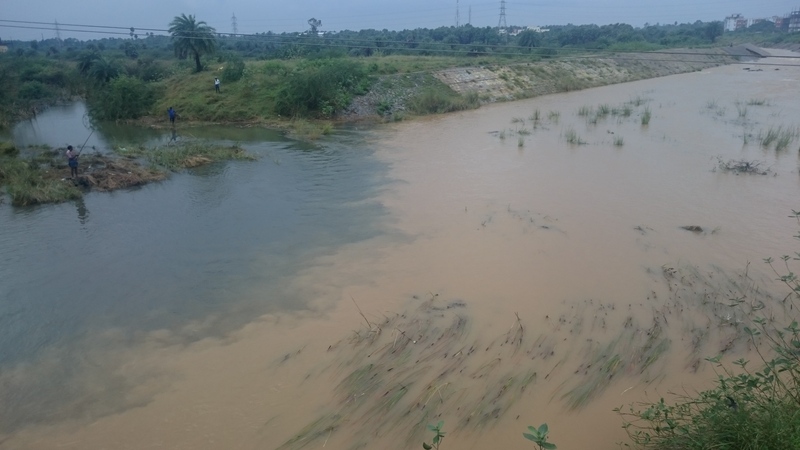 Is the surface clean or is it capable of polluting the groundwater? A nuisance to all residents nearby. I watch borewell drilling as I am interested in the Geology and hydrogeology. However, for many people this is sheer noise. Often these rotary drilling jobs take up to 4 hours. Plenty of dust flies into homes whenever the drill bit hits rock in between. Scientific monitoring and management not available. Is there an aquifer in that area? If so what type? Would puncturing the aquifer have any impact? How many wells can the aquifer support? What were the geological conditions 30 years ago? Was there a lake bed on which these houses were built? Are standard procedures in place and followed? I don’t see any of this. The wells are not numbered or used for mapping. Safety aspects not considered. The drillers don’t have any protective equipment. Am sure they are not insured. They don’t provide any specific masks or other such equipment to residents. What if there is an infant or an ailing person? What if someone is allergic to dust? Finally, is the hole sealed properly? Okay these are small holes but this negligence is what devours young children across suburbs in India. How horrific can we get? A well cap to seal water wells is mandatory for large diameter wells such as for agricultural or small factories. However, these have become “graveyard holes”. 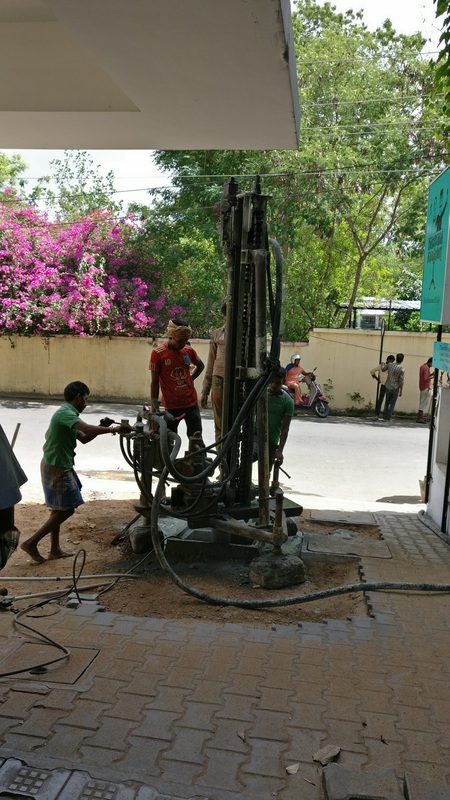 Okay the urban borewells are smaller – yet should they not have some indication? A marker maybe? A subject so close to heart and fascinating – hydrogeology. What is the use of developments in technology and science if the basic standards are not followed? What use is a new modelling software that can calculate infinite parameters and provide stunning 3D visualization if safety is compromised? No GIS tool will be able to use data if the wells are not licensed and monitored. The driller in these pictures was okay as this did not compromise safety issues. 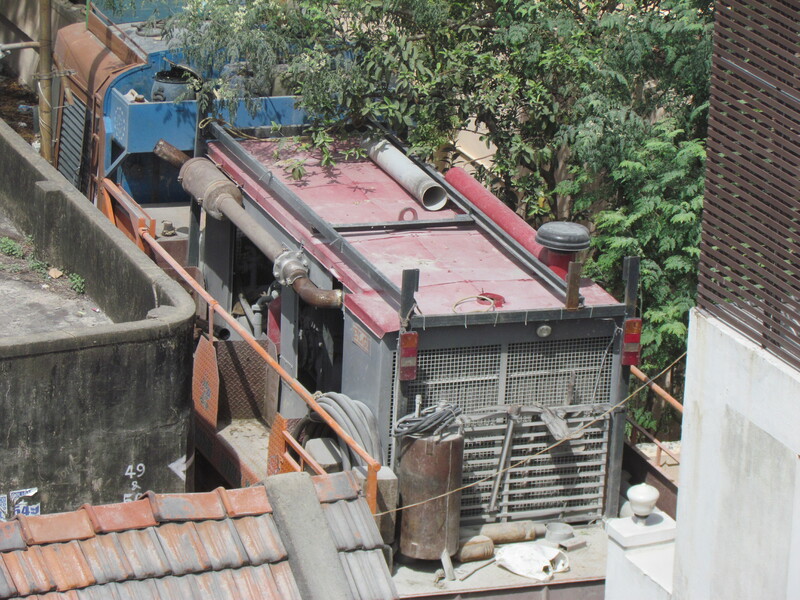 However, I have seen far worse borewell drilling reports on YouTube and elsewhere. Maybe it will take a catastrophe of monumental proportions to stir something and lead to better practices. In this piece am not discussing the effects of non-pervious surfaces such as roads and concrete that prevent proper rainwater drainage. Am worried about the drilling approach in populous and cramped cities. 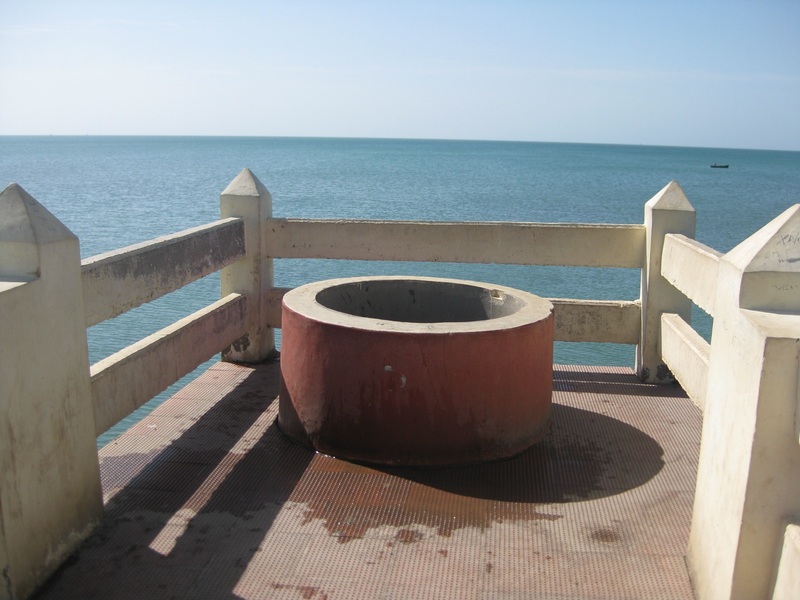 In Rameswaram, an Island on the South east coast of India, there is a well some distance into the sea that provides water which is not salty and can be drunk. This is a holy place and according to Hindu mythology Lord Rama shot an arrow into the sea to get water to drink for his wife Sita. This is known as the Villundi Tīrtham well. How is it possible that you get non-salty water amid the sea water? On land, groundwater occurs beneath the surface in what geologists call as Aquifers. Aquifers are geologic formations that can store and transmit water. Note that geologic formations are rock strata that have similar properties (for example rocks of a certain chemical and mineral nature is one such property). These have been deposited over millions of years (if you are interested read about stratigraphy, erosion, landforms, geologic time, etc). Under some instances water gets collected from rain, rivers, and other sources and is stored underground in aquifers. 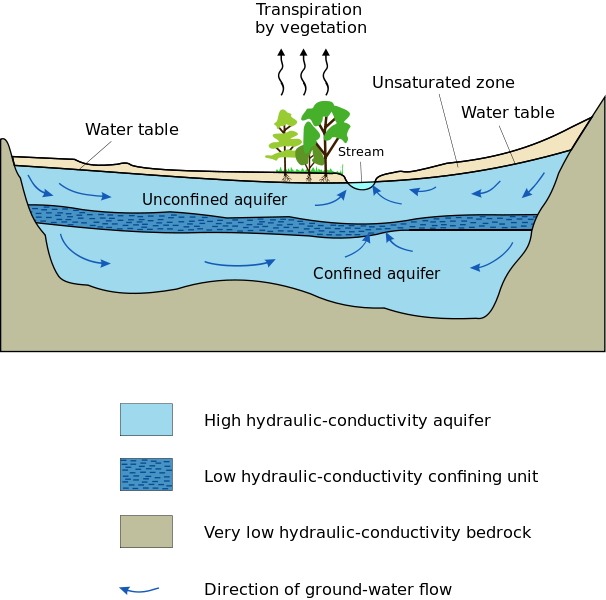 Aquifers constantly interact with other water sources, atmosphere, and is governed by forces such as pressure and gravity. The geologic formations too determine the aquifer’s nature – porosity, permeability, storage capacity, etc. Groundwater near the coast interacts with the sea water too. The figure (source: Solinst) shows theoretically how groundwater exists. In reality though it is very complex. Groundwater is recharged by rain and lakes or rivers. Thus Groundwater is not stagnant and flows. The flow is described by Darcy’s law which in simple terms means “groundwater flows depending on pressure and the length of the aquifer medium”. This pressure is the reason we are able to dig wells. This is often the capillary pressure. Groundwater can be confined within strata and be under pressure. Or it may not have a confining layer and could be seen close to the surface. The level to which groundwater can raise is the water table. Of course this is only for groundwater that is not confined by impervious or semi impervious strata. The potentiomentric surface is used to describe the water table level. On the coasts, groundwater exists in “dynamic and often transient equilibrium” with sea water. Sea water is denser and filtrates into the ground beneath the sea and on to the land. 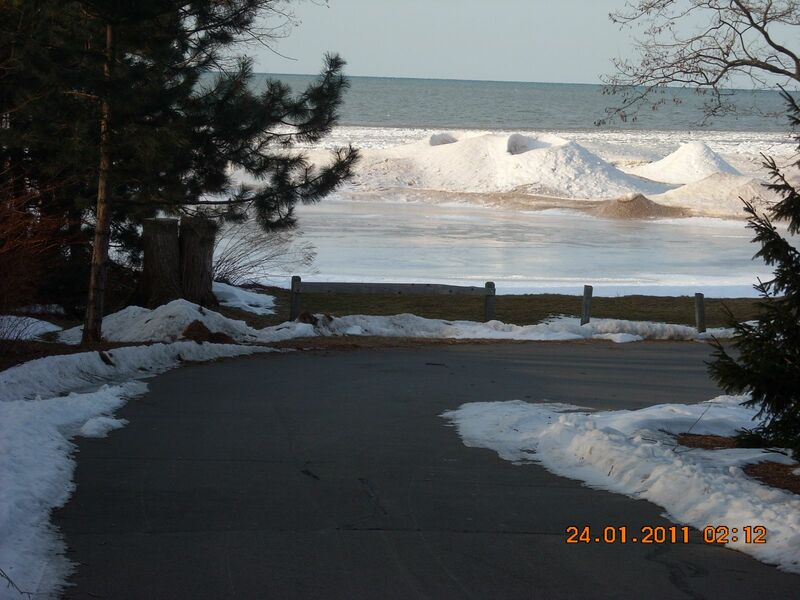 Groundwater should flow – discharge into the sea – as long as the water table level is at a higher pressure gradient. 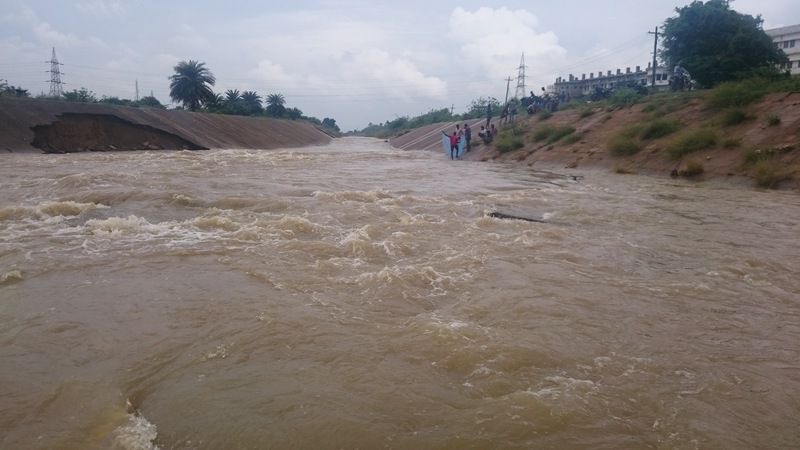 Sea water in turn will try to flow in and contaminate the fresh groundwater. There is a seawater-freshwater interface (not a sharp line!) that is transient and keeps changing with rainfall, river or lake discharge, tides and evaporation. 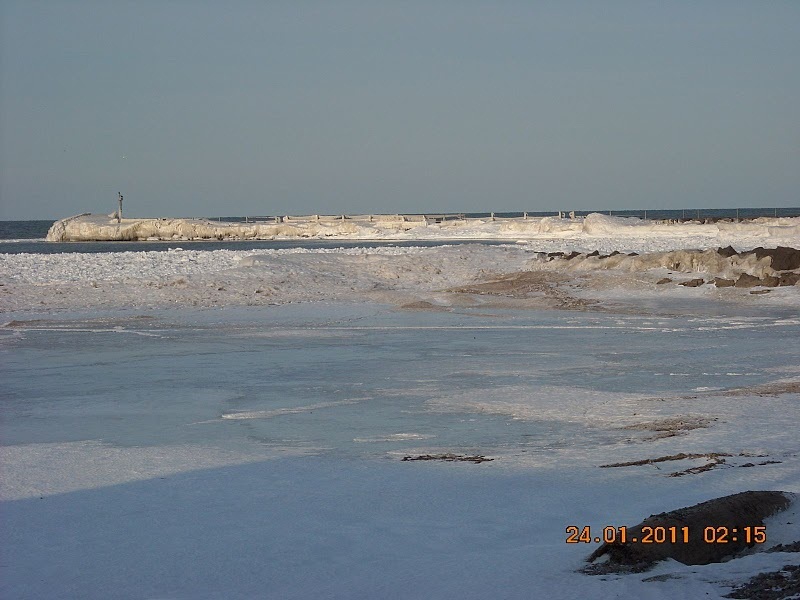 If humans pump out water from the coastal areas, sea water intrudes the fresher groundwater. The Gyben-Herzberg equation governs the fresher groundwater aquifer-sea water interface. For every feet of water on the surface, some 40 feet of groundwater exists below sea level. 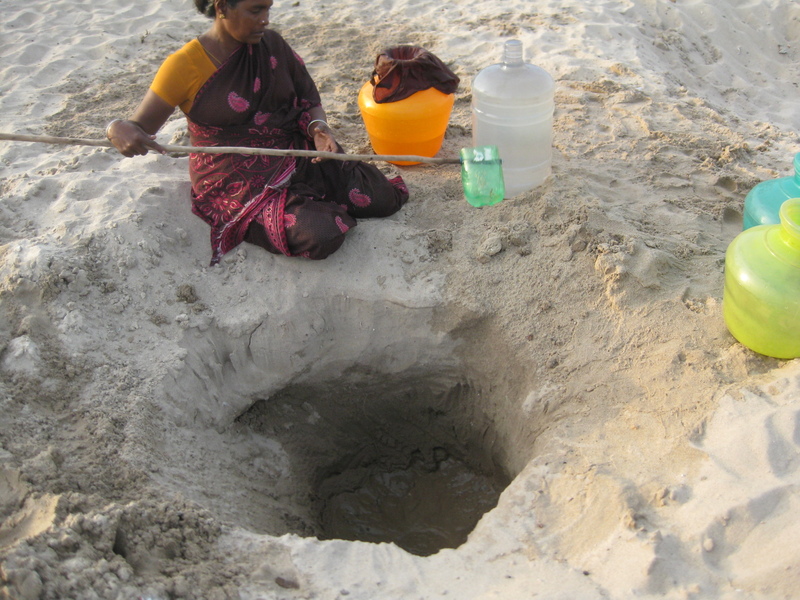 So what does it have to do with this freshwater well in the sea? If you dig a well in the sea you expect to get saline water. Yet, the well provides drinkable water because of these possible scenarios:- the freshwater-sea water interface extends far into the sea even beneath the waves. Highly unlikely as the water table pressure would need to be immensely high on the land! – there is submarine discharge of groundwater from a confined aquifer beneath the sea at this place. The strata confining the aquifer prevents water from seeping out on the land side but there is a hidden interface on the sea side.This is possible. – maybe seawater has “transgressed” only on the surface and below the surface is stopped from infiltering by impervious formations. So this must be some kind of mix of these situations. The sea water here is pretty static – no waves in sight. Modeling coastal aquifers is a major headache. On Islands, the Fetter analytical solution applies better. I will not describe that here. So is it possible? Yes. 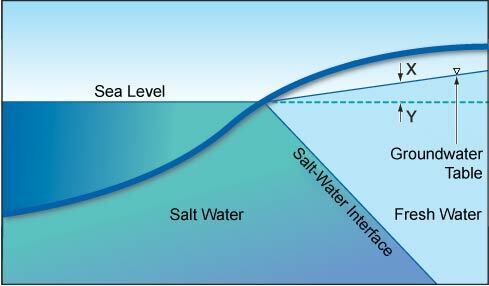 Fresh water is less denser than salt water and “floats” on salt water. This is important when you bore into the groundwater in islands. Rain water percolates into the ground and pushes the salt water beneath it. So you need to model the interface where freshwater and saltwater mix and take care not to disturb this by puncturing into sea water (when you drill). Similar examples exist at Cuba and the Gulf of Mexico. There are 22 wells in the Rameswaram temple – on a shallow coastal aquifer (unconfined) and close to the sea. The dissolved solids vary in each. So even if shooting the arrow part is not an acceptable theory, one must note the intelligence behind these wells. There was no technology and yet, this well was predicted to yield non-salty water. As you move north from Bangalore (India), the landscape changes – vast areas of reddish soil dotted with plenty of trees, agricultural lands, and low hillocks now and then and…lots of forest cover. This is the Tumkur district and used to be full of nondescript towns and people leading a simple life. Tumkur is also home to Iron ore.
Geologically speaking Tumkur is made up of rocks of Archaean Complex (Granitic Gneisses, and Schists) with some Deccan trappean and intertrappean formations. 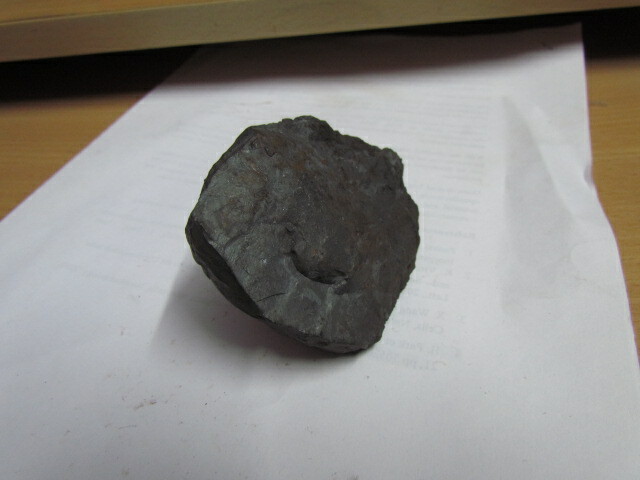 Haematite is the most prominent iron ore in this area. The iron ore occurs within banded iron ore formations in massive, laminated, friable form. The Cauvery and Tungabhadra make the land fertile enough. 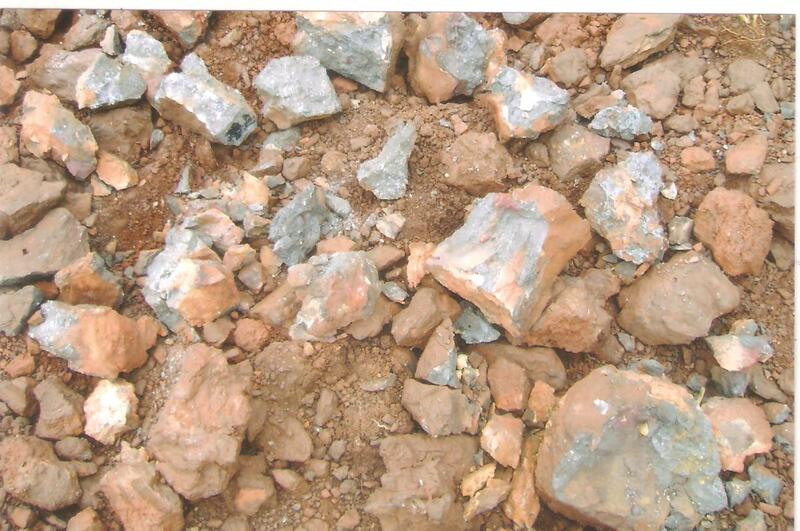 Iron ore is a gift of nature that brings in revenue and helps in technological advancement. However, in the name of mining, there has been exploitation. This has two aspects: 1. the country has been denied money from its own resources with some individuals resorting to fraud and 2. the environment has been severely affected as all norms have been flouted. The mining scam as it has been called by the media has rocked the country. Iron ore mining was run by authorized mines and everything was fine. Suddenly after 2000, China was ready to pay for iron ore to meet its infrastructure needs. In India mining licenses meanwhile had been issued to private companies in keeping with the opening up of the economy. Some mine owners started mining and exporting a lot of Iron ore. They provided false data about the iron ore mines and the money actually they got. They bribed the right people to help their cause. This resulted in loss for the government, honest stakeholders, and people. However, the people involved in illegal mining ranged from the top brass to the simple farmer. 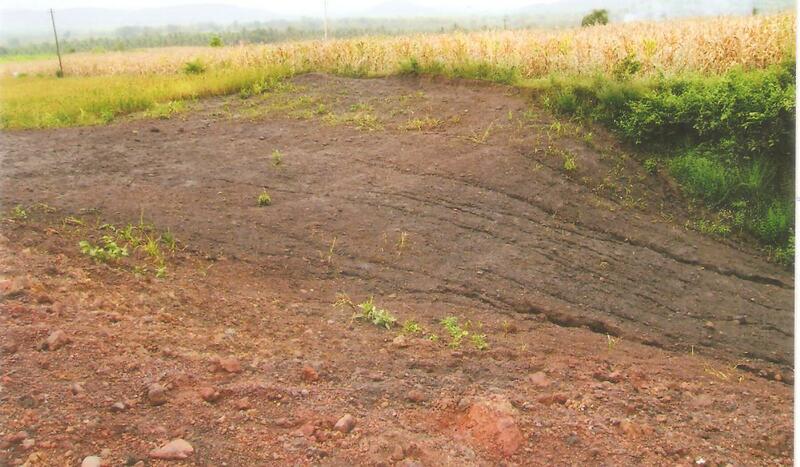 With the boom in mining, people started to sell their agricultural lands to mining companies. The companies would easily get a mining license and convert the agricultural land to a mining one. This dealt a blow the environment too. Account books were cooked and mine reports had false data. Many sold everything they had to invest in the so-called mining lands. Many millionaires were made. The money was never accounted for. Some waited too long to sell their lands and are desperate now – the losers at the end of the greed chain. 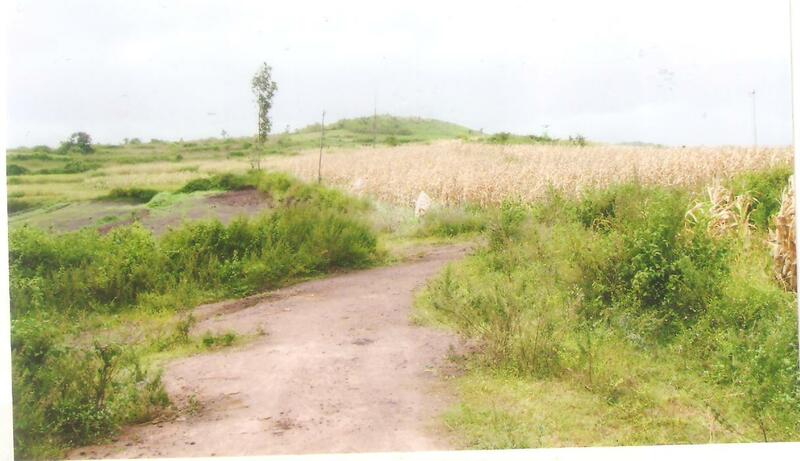 In photo: agricultural lands in Tumkur that a a farmer wants to sell as “mineable” land. Typically many people bought such lands close to mines and prepared false geochemical sheets and tried to sell their lands. Haematite ore is reddish with some “banded” striations while magnesite is black. Samples too may not be from the agricultural land that farmers sell. 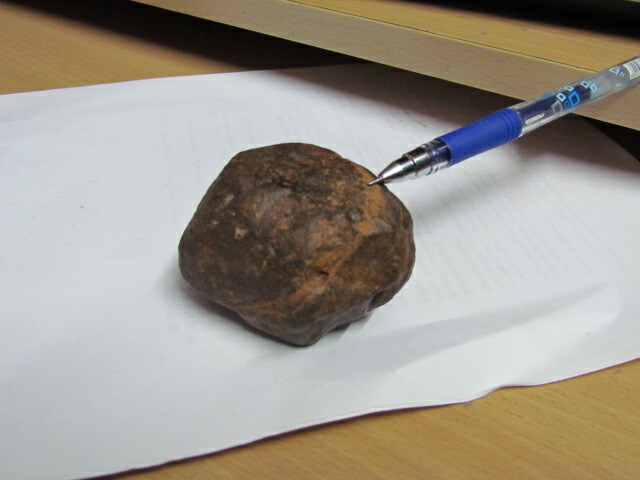 Samples are not always indication that ore is available in that land. Plate Tectonics is a geological theory that describes the following: formation of earth's crust, subduction, continental drift, sea-floor spreading, volcanic activity, earthquakes, mantle dynamics, and so on. Fate Tectonics is a blog to express my love and longing for geology. Contributors. If you want to write for this blog on Geoscience topics, leave a comment in one of the posts. I always loved physical Geography and Geology. I loved to talk and read about things like the Atacama desert salt, Dead Sea salinity, the Amazon delta that washes out sediments miles into the Atlantic, the undersea mounts, dinosaurs (my favorite was the stegosaurus), and so on. I even did a project in school on Karst - a working model of limestone caves with stalagmites and stalactites and explained it to visitors at an exhibition! Naturally, I studied a masters in Geology (I was particularly in interested in Sedimentology, Geochemistry, and Hydrogeology. I had to work due to financial constraints after my masters even though I wanted to do research. Moreover, in India it was difficult to find a job related to Geology that paid anything worthwhile. In 1995, the Internet was not so common and information related to geology was not great. Thus, I worked as a copy editor of geoscience journals (Springer and Elsevier) for a while. I moved on to the IT (software) industry and worked as a technical writer. I gave my 100% and did very well here too. In the past few years I have been lucky to write about software used in the geoscience field: GIS software and Seismic tools. I have also worked on documents used by the petroleum industry. I collect books on geology, hunt for rocks and minerals, and participate in projects related to geology whenever I get a chance (work keeps me busy otherwise). The interest has never been dormant - the rumblings have been there deep inside. Like a volcano...maybe the time to erupt in glorious fashion might happen anytime. The blog is my expression of my desire to be out on the field and do research. I still hope to get back to being a geologist (or at least get involved in the subject full time!) I might go for a PhD. I also use the blog to put up reviews of books and software related to geoscience. I have been a member of geological associations. Now that I can get around financially without being burdened by other commitments, I want to get involved in what I have always loved - geology. Paleontology, books and other stuff. A science blog that brings you closer to the world of geology! Featuring the "A Day in the GeoLife" and "GeoProject" guest blog series from geoscientists around the world. Volcanologist. Erupting at you from the City of Volcanoes.